341 Beacon is located on the south side of Beacon, between Exeter and Fairfield, with 339 Beacon to the east and 343 Beacon to the west. 341 Beacon was designed by architect Samuel D. Kelley and built in 1881-1882 by Frank Jones, mason, for building contractor Samuel Tarbell Ames, one of two contiguous houses (339-341 Beacon) of the same design with two story (plus basement) front bays on the eastern side. Samuel Ames is shown as the owner on the original building permit application for the two houses dated March 12, 1881. At about the same time, Samuel T. Ames had three additional houses built to the east, at 333-335-337 Beacon, also designed by Samuel D. Kelley in a similar style but with bays extending one more story. On October 19, 1881, probably while 341 Beacon was still being completed, Elizabeth F. (Trull) Welch Eldredge, the widow of John Hunt Welch and of Edward H. Eldredge, purchased the land from the Commonwealth of Massachusetts. She lived in Newton. Click here for an index to the deeds for 341 Beacon. By the 1881-1882 winter season, 341 Beacon was the home of Charles Webster Leonard and his wife, Emeline (Emma) Thacher (Welch) Leonard. Emeline (Welch) Leonard’s father, Wilson Jarvis Welch, was the brother of Elizabeth (Trull) Welch Eldredge’s first husband. Charles Leonard was a dry goods merchant and later would become a manufacturer of woolens. The Leonards continued to live at 341 Beacon during the 1886-1887 season, but had moved to Newtonville by 1888. 341 Beacon was not listed in the 1888 Blue Book. By the 1888-1889 winter season, 341 Beacon was the home of Anna Smith (Miller) Bigelow, the widow of former Massachusetts Chief Justice George Tyler Bigelow, and their daughter, Marian Glyde (Bigelow) Horton, the widow of Henry Kenney Horton, Jr. Mrs. Horton and her husband had lived at 287 Beacon prior to his death in December of 1887. In January of 1889, Marian (Bigelow) Horton remarried to investment banker and stockbroker Philip Van Rensselaer Ely. After their marriage, they lived at 341 Beacon and Anna Bigelow moved elsewhere. They continued to live at 341 Beacon during the 1892-1893 winter season, but moved thereafter to 478 Beacon, which they had built as their home. By the 1893-1894 winter season, 341 Beacon was the home of Elizabeth Elliot (Torrey) Spooner, the widow of shipping merchant and textile manufacturer Daniel Nicolson Spooner, and their two unmarried daughters, Ellen O. Spooner and Mary Torrey Spooner. They had lived at The Thorndike at 230-240 Boylston during the 1892-1893 season, and at The Huntington at the corner of Blagden and Huntington during the 1891-1892 season. Before that, they had lived at 196 Commonwealth. Elizabeth Eldredge died in July of 1895. She had no children by either of her marriages, and 341 Beacon was inherited by the three children of her first husband’s brother, Wilson Jarvis Welch, and his wife, Elizabeth Fearing Thacher: Elise (Eliza) Hunt (Welch) Read, the wife of gun dealer John Read, who lived in Cambridge; Emeline Thacher (Welch) Leonard, the wife of dry goods merchant Charles Webster Leonard, who lived in Newton; and Maria Eldredge (Welch) Morton, the wife of real estate dealer Marcus Morton, lived in Newton with Elizabeth Eldredge at the time of her death. On March 6, 1896, Elise Read and Emma Leonard transferred their interests in 341 Beacon to Maria Morton. Elizabeth Spooner and her daughters continued to live at 341 Beacon during the 1896-1897 winter season, but moved thereafter. By 1898, they were living in Baltimore, where they remained until the early 1900s. 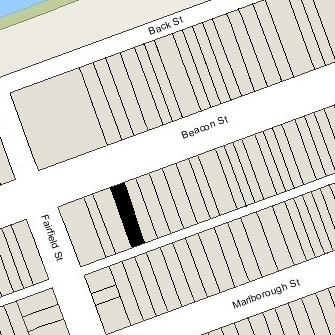 By the 1903-1904 winter season, they had returned to Boston and were living at 381 Commonwealth. During the 1897-1898 winter season, 341 Beacon was the home of Nathaniel Hugh Cotton and his wife, Harriet Emma (Clapp) Cotton. N. Hugh Cotton was a West Indies shipping merchant. By the 1898-1899 season, 341 Beacon was the home of investment banker (and future President of the Museum of Fine Arts) Gardiner Martin Lane and his wife, Emma Louise (Gildersleeve) Lane. They previously had lived in Cambridge. They also maintained a home, The Chimneys, in Manchester. They continued to live at 341 Beacon during the 1904-1905 winter season, but moved thereafter to 53 Marlborough. On June 13, 1905, 341 Beacon was purchased from Maria Morton by William Amory, II. He and his wife, Mary Remington (Stockton) Amory, made it their home. They previously had lived at the Hotel Royal at 295-297 Beacon. William Amory was an textile manufacturer, serving as treasurer, then president, and then Chairman of the Board of the Pepperell Manufacturing Company. He was known as William Amory, II, until after the death of his uncle, William Amory, Jr., the son of William Amory and Anna Powell Mason (Sears) Amory, who died in 1907. William and Mary Amory continued to live at 341 Beacon during the 1923-1924 winter season, but moved thereafter to 179 Commonwealth. On December 27, 1924, 341 Beacon was acquired from William Amory by real estate dealer George A. Shores, and on January 2, 1925, it was acquired from him by Jennie Bickford (Means) Joy, the widow of Franklin Lawrence Joy. She lived in Roxbury and did not immediately move to her new home. In 1925, 341 Beacon was the home of cotton broker Thomas Spriggs Blumer and his wife Nancy Warburton (Scott) Blumer. The previous year they were living in Manchester, and in 1923, they had lived at 294 Marlborough. By the 1925-1926 winter season, the Blumers had moved to 486 Beacon, and Jennie Joy had made 341 Beacon her home. She also maintained a home in New Ipswich, New Hampshire. Her son-in-law and daughter, Donald Kingman Packard and Beatrice (Joy) Packard, lived with her. He was a bond salesman and later a banker. Jennie Joy and the Packards continued to live at 341 Beacon during the 1930-1931 winter season, but moved thereafter to Chestnut Hill. 341 Beacon was not listed in the 1932-1937 Blue Books, and it was shown as vacant in the City Directories from 1932 through 1942. On December 5, 1939, 341 Beacon was purchased from Jennie Joy by Mildred Marie (O’Brien) O’Meara, the wife of real estate dealer Henry Joseph O’Meara. On October 23. 1941, 341 Beacon was acquired from Mildred O’Meara by real estate dealer Horace C. Hunt. On December 29, 1942, 341 Beacon was acquired from Horace Hunt by Edward G. Lee, a civil engineer. He and his wife, Edna Marion (Grant) Lee, made it their home. They previously had lived in Wakefield. They continued to live at 341 Beacon until about 1947. On July 21, 1947, 341 Beacon was purchased from Edward Lee by David Ashkenazy, trustee of the Ashe Realty Trust. In July of 1947, he applied for (and subsequently received) permission to convert the property from a single-family dwelling into nine apartments. On November 1, 1956, 341 Beacon was acquired from David Ashkenazy by Marjorie (Lucas) Reed, the widow of Harvey Lincoln Read, Jr., and their son, Harvey Lincoln Reed, III. They lived in Waban. Marjorie Reed also owned 339 Beacon, which she and her husband had acquired in December of 1948. Harvey Reed, III, died in May of 1982. On April 27, 1984, 339 Beacon and 341 Beacon were purchased from Marjorie Reed by Christine Curran, trustee of the 339-341 Beacon Street Trust. On October 11, 1985, 339-341 Beacon were purchased from Christine Curran by 341 Beacon Street Associates (a joint venture of H & P Associates Limited Partnership II and First American Development Corporation III). On the same day, 341 Beacon Street Associates also acquired 343 Beacon. 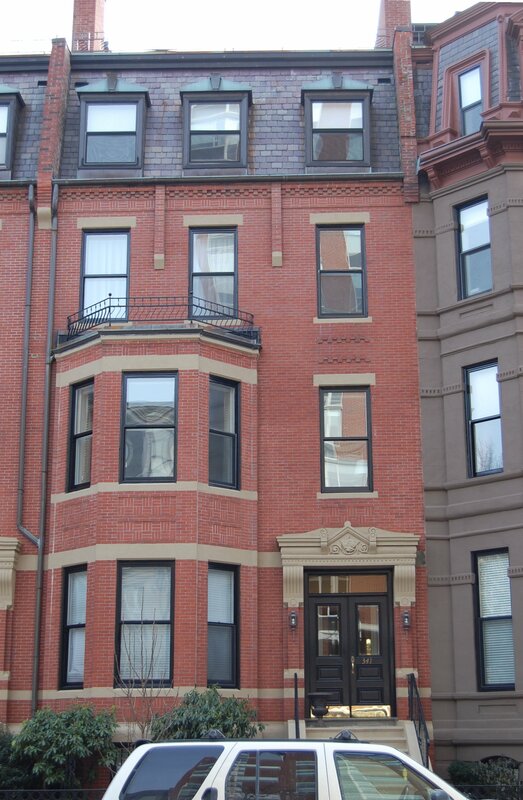 In July of 1986, 341 Beacon Street Associates applied for (and subsequently received) permission to combine 339-341-343 Beacon into one property, add an additional story to 339 and 341 Beacon, aligning it with the roofline of 337 Beacon, and add a penthouse and roof deck on all three buildings. On August 20, 1987, 341 Beacon Street Associates converted 339-341-343 Beacon into twenty-three condominium units, the Beacon Place Condominium.